Product prices and availability are accurate as of 2019-04-20 02:40:40 UTC and are subject to change. Any price and availability information displayed on http://www.amazon.com/ at the time of purchase will apply to the purchase of this product. 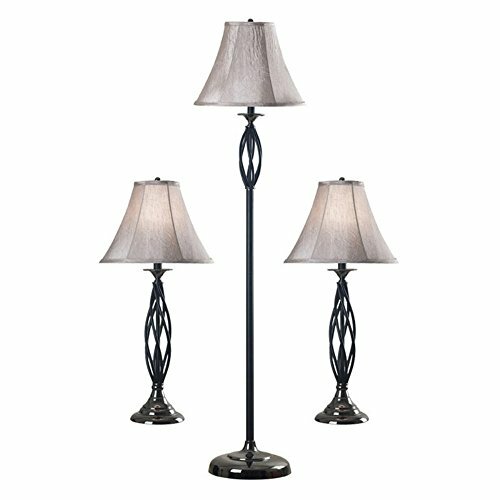 This Kenroy Home 30350 Sperry 3-Pack Lamp Set is as attention-getting as a 50's movie star. Woven dark bronze bands create a graceful see-through body, and the glossy polish on the base reflects the soft light from above. The light gold crinkle shade washes the room with warm, bold light. This matching set includes two table lamps and a matching floor lamp. The lamps each use one 100-watt 3-way medium base bulb (not included). Employee-owned Kenroy Home creates a large range of lighting and home decor products. Having recently purchased Hunter Lighting Group, Kenroy Home is now positioned to expand their product lines and take their customer focus to the next level. With an experienced team and advanced equipment, Kenroy Home provides an unparalleled spectrum of products and services. Trained designers and technicians create functional works of art that exceed appearance and performance expectations. Their craftsmanship matches materials and finishes to each application for showroom quality at superior values. Product collections are designed to facilitate mix-and-match coordination. Table lamp dimensions: 28H inches. Floor lamp dimensions: 58H inches. Modern transitional style. Bronze finish. Set includes two table lamps and one floor lamp. Light Gold fabric flared hexagon shades. Table shade: 13W inches, floor shade 14W inches. Lamps use one 100-watt 3-way medium base bulb (not included).